About Spiritual Tourism or Self Actualizing Tourism ? It was a blissful experience, meeting the Lord at Triprayar, during Triprayar Ekadasi. He was seated on elephant back. There were 22 elephants and it was a great festival! This Ekadasi is the 11th Lunation in the Dark Half of the lunar month of Karthika. This is the famous Uthrali Kavu temple in Trichur. 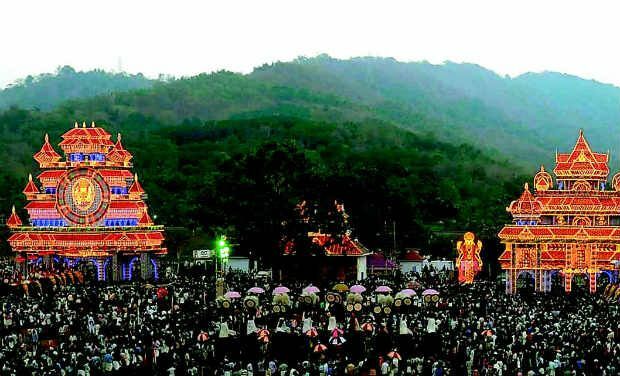 This Mother Goddess Temple is situated in the halcyon pastures of Wadakkancherry Dist, famous for its annual Pooram Festival. This Festival is famous and is replete with thrills and excitement with the procession of a number of elephants, accompanied by Pancha Vadyam and Pandi Melam, repercussion symphony which can even outclass the r s of the famous Trichur Pooram. This is the Olakkayam Waterfalls, still unexplored by Eco Tourism, in the District of Trichur. Within one hour of walk, you can reach the main waterfall. If you come from Kochi, you have to take the Mannuthy - Marathakkara Bypass. Take a right turn from Kuttanellur Junction. Kerala Tourism nets 21125 crores in 12 ! It was Walter Mendis, the Corporate Creative Director of Mudra, who gave Kerala the name ” God’s own Country”. He meant Kerala is as beautiful as the Lord made it, bearing on every feature the unmistakable stamp of the great Original Creative Artist ! 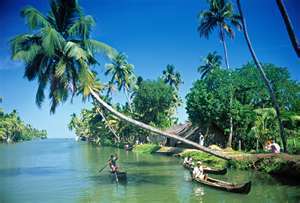 Kerala is amongst the top 40 destinations in the world. National Geographic is of the view that she is amongst the top ten ! More than 21 K cr has come in and more than 8 lk foreign tourists visited this beautiful state out of a total of 10.8 million tourists. This 21,125 cr is 8% of Kerala’s total income. Kerala is a state fashioned by the Monsoons. The South West Monsoon, the North East Monsoon and the Summer Monsoon always protect Kerala and she is one of the few states which report rains every month and receives more than 3000 mm rainfall per year. With the result, the climate in green Kerala is pleasant ! Kerala has a lot to offer. Houseboat Tourism, particularly in the Venice of the East, Alleppey, Beach Tourism, because of the 586 km coastline, River Tourism, Mountain Tourism & Monsoon Tourism, because of the heavy rainfalls that grace Kerala ! Kerala is just 1.1% of India ! Yet, she hosts 22% of 47 K plants, 35% of varieties of fish and 210 types of oceanic creatures. She has 700 kms of the Western Ghats & 586 kms of coastline. She receives 2000 mm rains. You will find different types of people belonging to different civilisations as she is multi-cultural and multi-religious. That is how Kerala becomes the Lord’s own country ! The foreigners say that ” well kept beaches, good people, tasty and mouth watering cuisine, spirituality and Ayurveda ” are the hallmarks of Kerala ! Beaches are a fascination for tourists and the four out of the five Districts which receive the influx of tourist have beaches ( Trichur, Trivandurm, Ernakulam, Alleppey and Idukki ). Some fishing villages have been defined as Fishermen’s Village. Farm Tourism is also on the rise. The plan of the Sea Plane project is to provide service initially in the priority circuit, consisting of the three major airports of Kerala and the prime destinations, Ashtamudi, Punnamada, Kumarakom, Bolgatty and Bekal in the state. 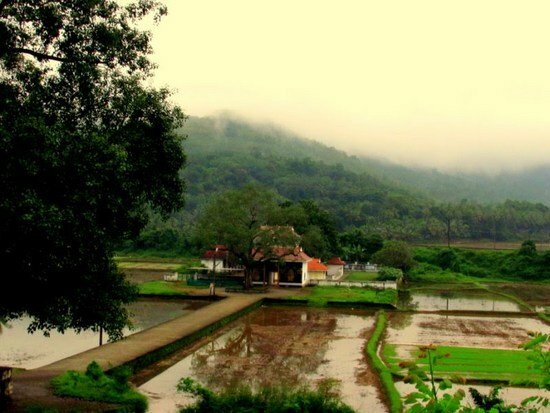 Kerala is the flag bearer of Ayurveda, as a rich ecosystem is housed in the Western Ghats. The W G has been defined as one of the eight biodiversity hot spots, because of the immense medicinal plant reserve. Ayurvedic institutions have been given Green Leaf and Olive Leaf and a tourist, looking for therapeutic treatment can get world class alternative medicinal facilities. Great traffic was seen at Arthirappilly Waterfalls yesterday, as schools closed for vacation. Cherai Beach in Vypin Islands also received heavy rush of tourists. Real estate prices at these places have catapulted, reaching unprecedented heights. Kochi had seen a realty boom and this realty boom was experienced in Trichur Dist, in areas proximate to Kochi, like Azheekode and Kodungalloor. Due to the global meltdown, however, transactions have come down. But then this is a temporary lull and after some years, realty will boom. I celebrated the Hindu New Year with a trip to Vallarpadam.I was accompanied by my friend, Ajith, who is the Devaswom Auditor. From High Court Junction, we took a bus to Vallarpadam. First it traversed Bolgatty Island and then we reached Vallarpadam. We went to the Vallarpadam Church, which was neatly maintained. Work is still in progress at the ICTT and then we took a bus to Vypeen Island, where a 60,000 crore investment is in the offing. We took a bus to Munambam harbour and the bus traversed Cherai, Nayarambalam, Jnarakkal etc.These islands are connected by the Goshree Bridges and GIDA ( Goshree Islands Development Authority ) is in charge of all projects. Along with the 80,000 cr investment in Kochi, another 100,000 cr INR is in the offing. We had a plan to go to Vypeen Jetty and then take a boat to Ernakulam mainland, but then we abandoned it as we reached Munambam. 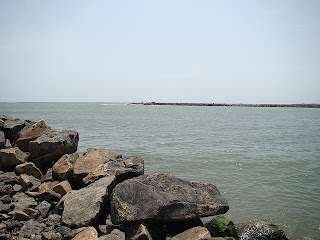 From Munambam Boat Jetty, we took a boat to Azheekode, which is just 5 kms from Kodungalloor. From Kodungalloor, I came back to Trichur. Kerala Tourism can revive you to recharge your body and soul, capturing you with her tantalising beauty. Kerala Tourism figures primarily in Indian tour attractions and Kerala Tourism is blessed with attractions like Kerala backwater tour packages, Kerala Wildlife Tourism, Kerala Hill Station Tourism, Kerala Beach Tourism etc. Your experiences will be out of this world, as God's own country captivates you with her exquisite beauty. Nila under Mrigasira Njattuvela ! Today I got up at 5 AM and went to Thirunavaya to do tharpanam for my mother. I had cold, a bad tooth ache and was afraid I may get the rains. It was Makiryam Njattuvela in full swing, too. It was raining slightly when I left Trichur. I did tharpanam at 09 and there were no rains fortunately. But after 80% tharpanam was over, rains began to appear,.At 95%, I got the full blast ! Then I ran for cover. It seems it has not rained well in Malappuram. 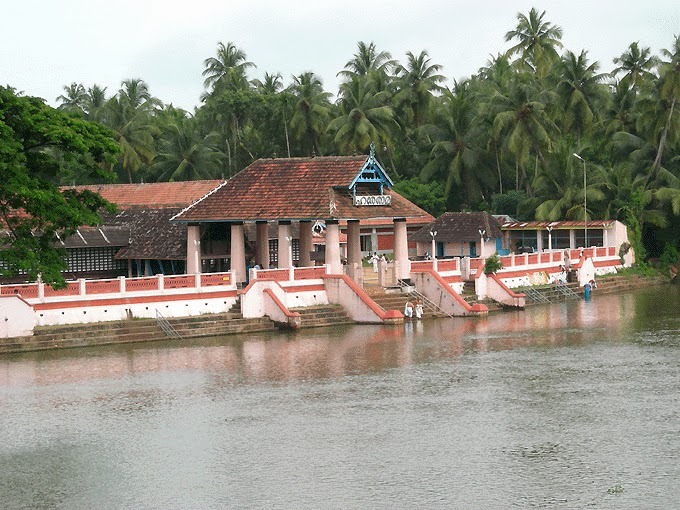 Bharathapuzha had only a small amount of water. Then it rained cats and dogs today. When I reached Guruvayur, the sky was dark and it was raining heavily. The Sun dematerialised himself. It was a dark day and it rained throughout. No wonder the ancients said " Makeeryam mathi marannu paiyyum ". We hope the succeeding Njattuvelas will bring home the bacon, Aridra, Punarvasu and Pushya. Punartham puzha pole and Pooyam puka pole ! Yesteday was the end of the lunar month of Vaishakha and the Vaishakha New Moon day. Hence there was big rush in Thirunavaya ! I reached Thirunavaya at about 0830. The rains were there till 0730 and I could do the Sraddham without rains. When I left Thirunavaya it was not raining. 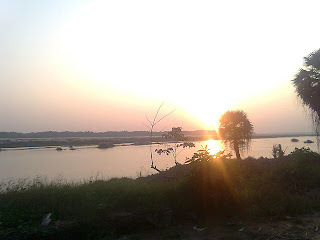 The Nila has only some water, but the priest told me that after Makiryam Njattuvela is over, after 14 days, the water level will rise 12 steps high ! Below is a photo of the Ponnani Estuary, where the Ganges of Kerala, the Bharatha Puzha, flows into the Arabian Sea ! One of the temples in Bali. 92% Bali is Hindu and Bali is home to more than thousand temples. People here practise Balinese Hinduism. 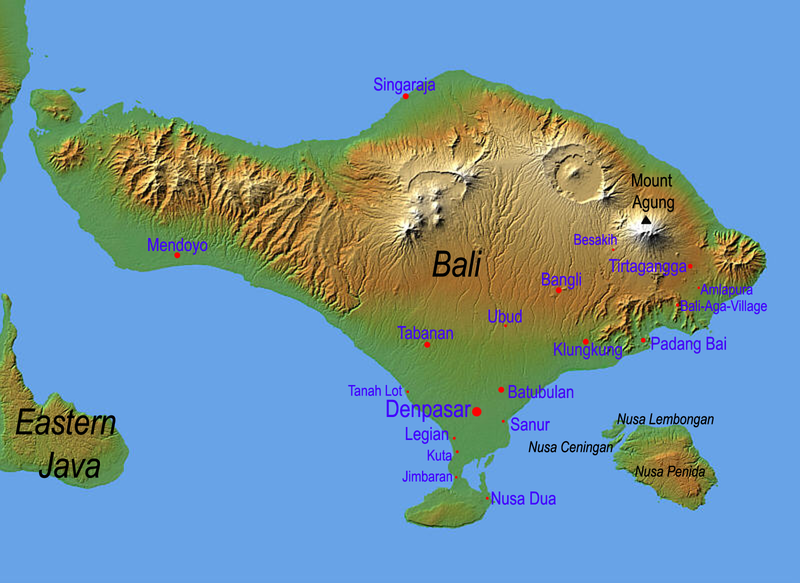 With a population of more than 3 million, Bali is home to Indonesia's Hindu minority. She is the largest tourist destination of Indonesia. She is renowned for her well developed arts, including dance traditional and modern, painting, leather, sculpture, music and metal working. 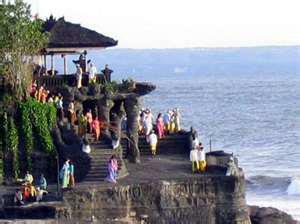 80% of Bali's economy depend on Tourism. 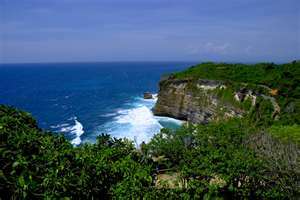 Tourism is now the single largest industry and Bali is one of Indonesia's rich regions. An offshoot of tourism is the burgeoning real estate industry. Five stars hotels are under development in the Bukit peninsula. Foreign and domestic investment in other areas also continues to grow. Bali gets 2.5 million FTA or tourist arrivals. India gets only 6 million ! We have to step up Marketing. Indian Govt had ignored Tourism Marketing earlier, saying that it is a pastime of the rich ! We have to change ! Indonesia as a whole gets 6 m tourists, but then India is bigger than Indonesia ! best libraries in the world, as well as the great Encyclopaedia, the Internet. is noteworthy ! Contact Term-papers.